The historic Roberts store in Woody Point in Newfoundland, Canada is situated on the waterfront where boats can easily be hauled out. 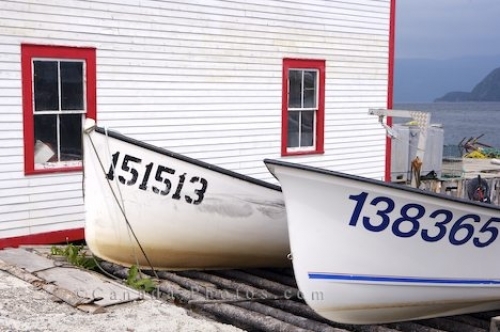 Two fishing boats marked with their identification numbers have been pulled out of the water on the wooden ramp beside the historic Roberts store in Woody Point, Newfoundland, These boats are left here when not in use by the fishermen or visitors to Woody Point wishing to try their luck at fishing. The Roberts store has been constructed on a historic private property overlooking the bay in Gros Morne National Park in Woody Point in Newfoundland, Canada. Boats hauled out beside the Roberts Store a Historic Property in Woody Point, Gros Morne National Park, UNESCO World Heritage Site, Viking Trail, Trails to the Vikings, Highway 431, Northern Peninsula, Great Northern Peninsula, Newfoundland Labrador, Newfoundland, Canada. Picture of the small fishing boats beside the historic Roberts store in the town of Woody Point in Newfoundland, Canada.